How would you love to have a buddy assisting you as you launch or grow your business? How would you love to have someone who is there to guide you each week, pick you up when you fall and help you keep going when you face adversity? The Weekly 3 does just that. You get 44 weeks of tips, tools, strategies and ideas that you can take with you along the journey of entrepreneurship. ! The book is packed with street smart ideas and wisdom from business coach, author and former host/producer of the Small Business Big Ideas Show, David Cohen. ! If you are an entrepreneur, or thinking of going into business for yourself, then you have landed in the right place. I want to thank you for buying this book. You will get a lot of value from reading this book. My promise to you is that it will teach you about the key core areas of running a small business and the other key goal, is that it will inspire you each week to keep at it, not lose the hope and to learn skills that will help you succeed. The book is broken down into various parts…the parts that go into your business plan! From sales, to marketing, to operations, or to the money aspects of your plan or business, you will have some valuable lessons to guide you along the way! Plus, we will address you having the leadership and management tools to help you survive in these times of remarkable change. The bottom line is that you will have the leadership lessons and strategic ideas you need to think about to succeed in life and in business! I am proud to say, that this is my second book. This is my second business book, and both geared to small business owners. If you got to know me, you would find one of my passions is around personal growth and sharing ideas for successful living…little did I know growing up, that I would be doing this kind of work, but it does drive me…BIG TIME! You put your heart and soul into it! You sweat at night thinking and worrying! The stories David shares will enlighten those who are thinking about getting into business for themselves. The resources provided will allow anyone serious about the success of their business to hit the road running and have a fighting chance at success. Cohen’s warmth, humour and humble demeanour shine through his book. Each chapter took me by the hand, guiding me step-by-step, supporting me through my start-up’s challenges, and celebrating triumphs along the way. Cohen’s expertise and charm are ever-present, dispelling myths and sharing the journeys of other start-ups. Any entrepreneur can benefit from a solid coach, and I believe this book is the next best thing. David Cohen’s passion to help budding entrepreneurs certainly shines through in this book chocked full of helpful information page after page. I learned so much and believe it’s a must read for anyone in business. "We are all living through exciting times and there is no better time to follow your passion and become your own boss. But embarking on the journey of entrepreneurialism has its learning curves and challenges one needs to overcome. 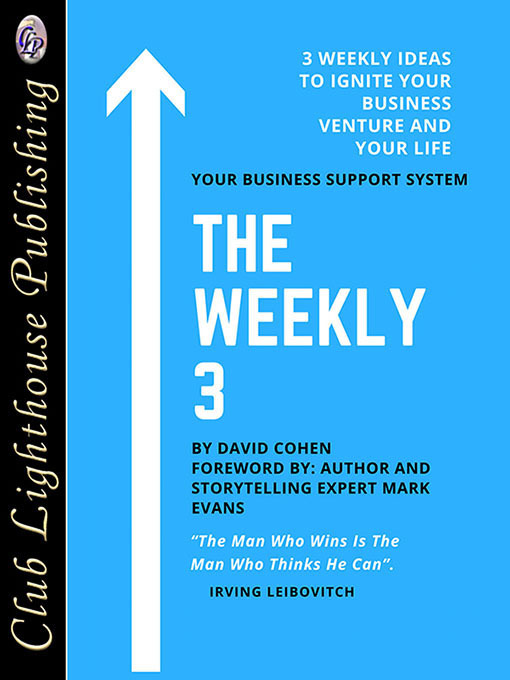 David Cohen's book " The Weekly Three”, is an awesome catalyst for your growth, and takes you on an insightful journey, while making it fun and easy! If you like boredom, you will not find it within these pages. If you are ready to start the greatest adventure of your life, this is your book. " Growing a business can be complicated but it doesn’t have to be. 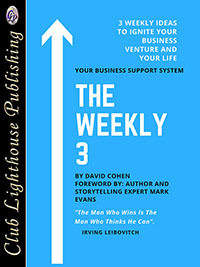 I love how David has structured this book into the components of a business plan, and then into 3 manageable weekly steps that build upon each other for success. Well done!